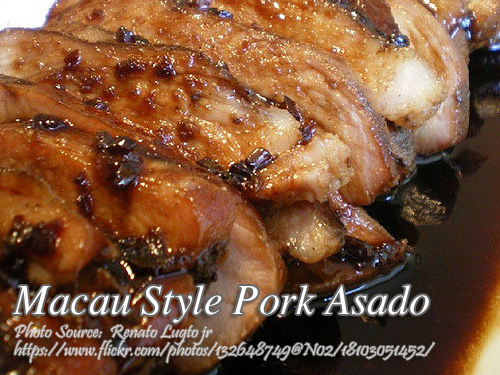 This Macau style pork asado require only just combining the ingredients together and cooking the pork meat until tender. No need to roast or broil the pork to make a Chinese style pork asado. Just combine the pork, soy sauce, sugar, peppercorns, salt, bay leaf, garlic, anise, water and mushrooms. Then cook until the meat is tender. Garnish with cashew nuts, parsley or spring onions. Boil and simmer pork with all the above mentioned ingredients except cashew nuts. If sauce dries and pork is not yet done, ad more water. Boil over low fire until sauce thickens. Add cashew nuts when about to serve. Garnish with parley or spring onions and cut into 2-inch long sprigs. Best when served with pickled papaya.